Spare a thought for the music biz: over the past seven years, overall sales of recorded music have been slashed by 50%. Whole parts of the business, such as CD plants and retail outlets, are disappearing. Even professional users, such as video games and TV stations, are putting pressure on the rates to be paid. In fact, the very notion of a “record” business is no longer really applicable. Midem, as the worldwide music community’s annual gathering, has obviously been affected by this. Despite what you might think, the trade fair has been growing over the past few years (with the obvious exception of last January when it fell right after the credit crunch). How? By staying one step ahead of the game. The traditional role of a trade fair was to enable companies to showcase products and services and meet people. So the operators were basically companies that sold square meters to other companies. With the web, something as mobile as music has no problem finding showcases that are faster and cheaper. And if you’re looking for contacts in the music biz, LinkedIn has literally thousands of people willing to meet you. So what could a trade fair possibly have to offer? 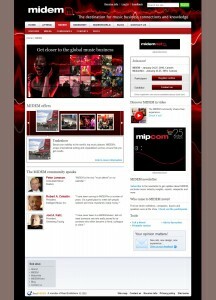 This is the challenge facing the developers of the new website and indeed Midem globally. The answer is quite simple: better ways to connect and the very latest market information. Although it seems like an easy conclusion, turning this into real customer benefits and an effective website is another matter. I won’t go into the changes on the trade fair site,which are quite extensive. But on the website, the new direction is reflected by offering lots of ways to engage with visitors through newsletters, Twitter and a very informative blog. They are also putting their noted conference sessions online throughout the year (hint: these involve monetisation of websites – you might want to check them out). Ultimately, the principle being applied is that you have to stay relevant to your target’s business, both in what you do and in how you offer it. The Write Stuff provided the copywriting for the new site and brochure through Consor, and we’re currently working on the newsletters.